I wish I were as good a writer as Joanne Will. She wrote an excellent article for the Globe and Mail about her family's last harvest in south western Saskatchewan. She really captured the heart and soul of the family farm, and the challenge for the medium sized farm that's been the backbone of farming there and in the Maritimes. These are farms that aren't as heavily capitalized as big corporate operations, but are much bigger than the smaller businesses that sell at farmers markets. Because of their scale they do have to compete in international markets with all of the uncertainty that comes with that. They are also farms that have been slowly losing money for years, while the equity they built up kept them in business. Joanne Will uses enough facts and figures to support her story, but mixes it with all of the intangibles that economists never get, like the role these farms play in rural communities, and the basic local knowledge that farmers carry around. 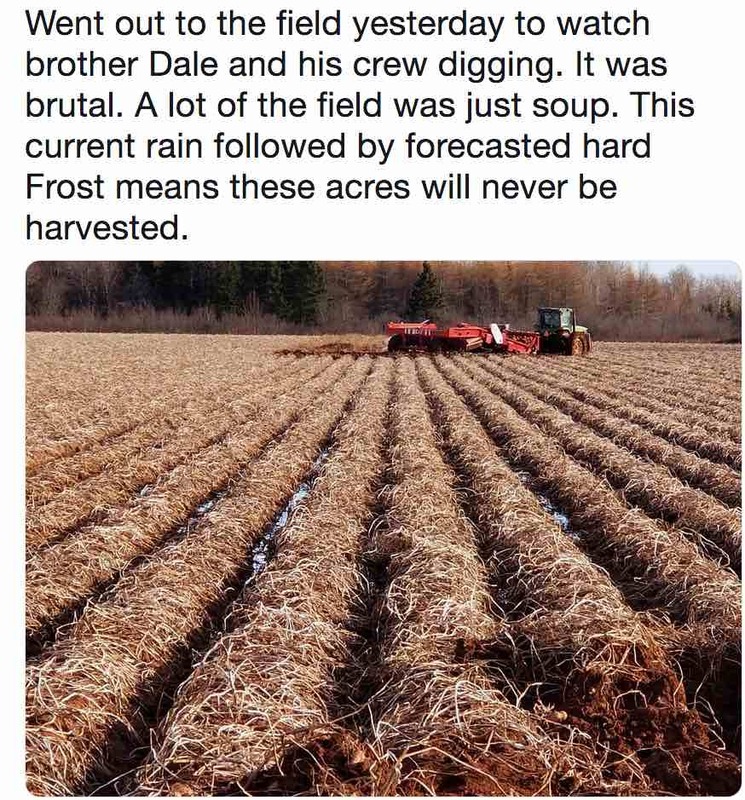 It's a sad story in some ways, and I really worry that the terrible harvest on PEI might push a few more farm families like this to call it a day. If that happens we're all the worse for it. Two interesting articles on food. One on the behind the scenes lobbying over new food regulations in Canada, the other on how morality has become part of what drives food purchases, but just for those who can afford it. Almost three years ago today, Prime Minister Justin Trudeau outlined his priorities for his new health minister. They included some big ideas to promote public health through healthy eating. They were, and are, urgent. In Canada, an unhealthy diet is the single leading risk factor for death. Millions of Canadians have diet-related disease, costing the public purse about $26 billion in 2015. Food Secure Canada and many other non-profit organizations working in the public interest have been raising alarm bells and proposing some big ideas for a very long time. But Big Food, despite consumer trends, appears to be marching to a different drummer, slowing all of us down. Two years ago, Health Canada announced its Healthy Eating Strategy with a number of action areas “to improve the food environment in Canada to make it easier for Canadians to make the healthier choice,” which we support. Trans fat regulations were recently announced, but we’re still waiting for the three other pillars: mandatory front-of-package nutrition symbols; restricting marketing of unhealthy food and beverages to kids; and revising Canada’s Food Guide. So what’s the hold-up? Thanks to transparency policies put in place by Health Canada, we can access public records of any lobby efforts on the Healthy Eating Strategy. This includes about 130 meetings initiated by the food industry and correspondence with public servants working on the strategy — more than a dozen by the Canadian Beverage Association alone. Though a significant number of food-related companies recognize that foods that are healthy, sustainable and local are the future, a closer look at each area of delayed action paints a portrait of old-school industry tactics meant to protect industry interests by watering down and delaying health-promotion policies. Let’s start with the front-of-package labelling. In Canada, the approach is symbol-based, designed to alert consumers when a food product contains more than 15 per cent of the daily recommended amount of a nutrient of concern to public health, such as sodium, sugars and saturated fat. A letter sent to the federal agriculture minister and co-signed by the Food and Consumer Products of Canada and the Canadian Federation of Agriculture argues the proposed labels “will cause food shoppers to feel undue, ingredient-specific anxiety,” and will “undermine public trust.” Public trust cannot be gained by refusing to display the information consumers need to make informed choices. Next up: marketing to children. Research has shown that food and beverage marketing to children affects the foods they request and prefer. Not surprisingly, the food and beverage industry spends billions of dollars on it. With a third of children in Canada overweight or obese, and 70 per cent not meeting the minimum daily requirement for fruit and vegetable consumption, one would think protecting them from advertisements for unhealthy food would be an urgent public health priority. Bill S-228, an act to amend the Food and Drugs Act (prohibiting food and beverage marketing directed at children), was first introduced to the Senate in 2016, and is still travelling through the legislative process. Canada’s Food Guide acts as a foundation for nutrition education and meal planning in homes, school, hospitals, daycares and more. It’s the second-most downloaded government document after income-tax forms. Over the years, the guide’s credibility has been questioned because of the undue influence of industry interest groups. We commend Health Canada for building a firewall around the current process: Bureaucrats developing the guide will not take meetings with industry until after the policy’s release, to ensure it’s in the public interest, informed only by the latest evidence. This has not stopped lobbyists from getting their message out through other government departments and processes, including internal memos intended to influence Health Canada’s work on the guide. One memo obtained by the Globe and Mail noted that “messages that encourage a shift toward plant-based sources of protein would have negative implications for the meat and dairy industries.” We think this is missing the mark because, more than ever, Canadians want to make healthy choices. This includes knowing where their food comes from, and supporting local and sustainable producers and food businesses. As we wait for the promised Food Policy for Canada, the government must decide if it will implement some Big Ideas in the public interest, or if it will allow Big Food to hold the rest of us back. Canadians need strong federal leadership to stand up for the real public interest: healthy people, healthy communities and healthy local economies. Consumers making better food choices will help support a necessary transition to a food system that is healthier, more sustainable, and more just. Forward-looking companies will bring those products to market. But better food policy is about more than the market. We need government to firmly act in the public interest and implement some bold new ideas. Fast forward to 2018, when we’re stuck on the idea of food as a reflection of our conscience; of good food as moral food, as virtuous food, as food that answers the question not of “what does food do to my body?” but, rather, “what does this food do for my soul?” Certainly, the core tenets of the sustainable food movement of today, which Mr. Pollan, Mr. Bittman et al defined in the early part of the aughts, have something to do with the health of the planet and, almost by luck, individual, physical health. But the terminology widely used by the sustainable-food movement (you know the buzzwords: “all-natural,” “organic,” “free-run,” “nose-to-tail” and all their friends and cousins) is more often meant to delineate a type of eating that is steeped more thoroughly in a sense of moral superiority than in the science of healthful eating – never mind the idea that, for food to truly be good, shouldn’t it also be easy to access? I was very pleased to have been asked to give a speech at the MacPahil Homestead, part of what's called the McRobie lectures. George McRobie was E.F. Schmachers friend and right-hand person, carrying on the "Small is Beautiful" legacy. I talked about many of things I've written in this blog, essentially that it's not fair to short-change farmers in the marketplace, and then not expect them to short-change their farming practices, that getting the economics right is essential to the kind of environmental stewardship we all want. Put another way: there are costs to cheap food that affect us all. I was very pleased to see a day later an article in the New York Times interviewing Wendell Berry. And what was he talking about? The need to get economics right on the farm to protect the environment. I did want to thank all of the people who came to the lecture. Thoughtful, mindful consumers are essential to getting our food system right and fair for everyone, and there was a whole roomful of these wonderful people that night. Inspiring for me. Ms. Olmstead is an Idaho native living and writing outside Washington, D.C.
Olmstead: The Farm Bill addresses many issues, including “rural development” — and rural communities desperately need help these days. Could the government help combat these issues, in your community and elsewhere? Berry: A farm bill sincerely intending to help rural communities might begin by proposing a program of production controls and price supports for every product of farming and forestry. At present, for example, the dairy “industry” is increasing milk production by millions of gallons every year, thus reducing prices and driving small dairies out of business. This of course serves the interests of large dairies. Olmstead: Many conservatives and libertarians see the Farm Bill’s handouts to large agribusinesses as the opposite of a free market. If small farmers are given a level playing field, they argue, more will succeed — and industrial agribusiness will no longer have a government-provided financial cushion. Berry: I distrust entirely the terms “free market” and “level playing field.” Those phrases are intoned as if they were the names of gods, but what do they mean? How exactly do the conservatives and the libertarians think small farmers would be served by the free market and the level playing field? The problem that has impoverished and destroyed farmers nearly always is that of low prices resulting from surplus production. That is also, obviously, a land-destroying problem. The only solution to that problem that can sustain the small farmers is the combination of production control and price supports as exemplified by the Burley Tobacco Growers Cooperative Association as it was reorganized in my region under the New Deal in 1941. I dislike recommending my own writing, but that organization and its work are explained pretty fully in “The Art of Loading Brush.” The conservative politicians and their friends in the Farm Bureau hated that program because it protected the small farmers, and they finally killed it. In its absence, our troubles have multiplied. Olmstead: Our trade war with China has highlighted American farmers’ reliance on the global market. Do you believe this reliance is a necessary risk in today’s globalized economy? How can these farmers safeguard their own self-sufficiency and well-being? Berry: I have been arguing for a long time, and I still argue, that an economy worthy of the name should begin with proper care of its sources in the natural world and in the local cultures of land use. Beyond that it should be based upon the principle of a reasonable self-sufficiency, from the household to the local community and on through the categories of political organization. Such an economy, within the variables of weather and human capability, would be formed within certain prescribed limits. To the extent that it would be limited and formed or formal, we might assume that it would be stable. Because such an economy has never been tried, we should not think of it with too much confidence. But there is certainly nothing limited or stable in our present casting about the “globe” for supplies and demands. This, like our present society, is disorderly if not chaotic. The so-called global economy, because it is predicated on the exhaustion of natural sources and of the land-use economies, is far from a sure thing. An interesting question, then, is whether we might intentionally reform our economies upon the principle of self-sufficiency or be forced to do so by the failure of the global economy. Farmers by themselves can’t protect themselves in a “free market” economy whether it is national or global. At present they have only the very limited self-protection of supporting their own lives so far as possible from their own land — that is, by producing their own food and fuel, and by harvesting energy from their own sunlight. Berry: If you can persuade farmers that their hardships are “inevitable,” then you have got them very securely trapped and they can be safely forgotten by their political representatives and exploited by agribusiness corporations. Inevitability and objectivity, like pessimism and optimism, are the names of programs offering freedom from choice and responsibility. If “technological progress” is the same as technological determinism, then there are no remedies. It can pretty well be demonstrated, however, that technological progress is the result of choices that have been made all the way from the inventors and manufacturers of technologies to the people who buy and use and pay for them. The important questions all have to do with the standards by which these choices are made. If the standards were different, different choices would be made. And in fact we have plenty of evidence that choices can be made that evidently were not made by your Iowa farmer. That the alternative choices often have to be made against powerful social pressures does not mean that they cannot be made or that they are not valid choices. The finally inescapable standards by which agricultural choices must be made are the ecological health of the farm and the economic health of the farmer. The problem of feeding the world should be addressed, first of all, by calculating the waste — from farmland and topsoil to thrown-away food — in the world’s “food systems.” Perhaps somebody has done this. If so, that is the place to start. The people, fairly numerous and highly credentialed, who argue that only industrial agriculture as we now have it can feed the world are arguing in fact that we can feed the world only by an agriculture that destroys both farmland and farmers. There is a point, obviously, beyond which this kind of agriculture will not be able to feed much of anybody. Olmstead: As farmers grow older, we seem unable to attract or keep young people on the land. For some, this is because of the cost of procuring land and starting a farm. But I have also talked to farmers who were told they were “too smart” to farm by high school counselors and mentors. These admonitions align with a larger cultural prejudice against manual labor and blue-collar work. Considering the challenge to farming’s future which this represents, how can we foster and renew a passion for farming? Berry: That smart people are “too smart” to farm is one of the set of clichés by which industrial agriculture has maintained itself. Another is that farming is “drudgery” or “mind-numbing work.” Another is that ex-farmers have been “liberated” from their hard, narrow, and depressing lives. These clichés are sustained by the “larger cultural prejudice against manual labor,” which you mention. But there also are active prejudices against farmers, country people, the country, small-town people and small towns. This at least begins the description of a large cultural problem. Because of such prejudices, and also because of economic adversity, farmers encourage their children to leave farming. Their departing children, so few of them as they now are, amount to an invaluable cultural and economic resource, to which our present economy attaches no value at all. Gracy Olmstead is an Idaho native living and writing outside Washington. I've written a lot over the years about my support for supply management. Canada cannot give up on it because of the mindless bullying of Donald Trump. But I think Canada must be willing to give up something. There's a complicated part of this story that I first wrote about back in June. It has to do with Canada exporting milk powder and competing with U.S. farmers. I think Canada should give this up, especially if it means retaining the basic integrity of the system. It gives Trump a win, and apparently it's the bottom line for U.S. agriculture secretary Sonny Perdue. Here's the background from a column in the Island Farmer. Canada’s national newspapers have been very consistent over the years in their condemnation of supply management. President Trump’s erroneous bombast on dairy has given them fresh material to work with. However there was one editorial in the Globe and Mail that revealed more about the newspaper’s biases than any problem with the regulated system itself. That last part is true. What’s shocking is that the Globe thinks there’s something wrong with this. Think about it for a second. Consider if there is any other industry where a smart editorial writer would argue that recovering the cost of producing a product shows there’s something wrong with the price. We’ve seen how taxpayers had to bail out the auto industry when it wasn’t recovering costs. We’ve seen giant retailers fail for the same reason. If the Globe had written that there’s excess profit because of protectionism (hello Canadian banks and airlines), fine, let’s argue about that. But this is saying when farmers can pay their bills it’s wrong. Even Sonny Perdue, the U.S. agriculture secretary who travelled to Lawrence MacAulay’s farm in Midgell two weeks ago to do a little fence mending after the G7 fiasco, had smarter things to say. Defying his boss he said Canada can keep supply management. What he doesn’t like is a new pricing agreement between Canadian farmers and processors for what’s called “class 7” milk. In simplest terms: northern U.S. dairies had been exporting diafiltered milk (think of protein powder) to Canadian cheese producers. It was a product created after NAFTA was signed, so came into Canada duty free (think cheap). Canadian farmers have now agreed to produce milk at the same price, so the Americans lost the market. As well, international trade rules prevent Canadian dairies from exporting dairy products at prices below what farmers get in Canada (always higher than the world price until now). The new class 7 has created a cheaper domestic price for skim-milk powder. Combine that with the low Canadian dollar, and now small amounts of Canadian powder are competing in traditional American export markets. Perdue put it this way: “You just need to manage it and not overproduce to create a glut of milk solids on the world market that’s being dumped at unfair prices.” That’s not an unreasonable concern, although the amount of product Canada puts on export markets is tiny and hardly the cause of U.S. dairy farmers problems. We will probably see complaints to the U.S. International Trade Commission, and the World Trade Organization on this issue. One more thought on milk. Maybe the U.S. dairy industry should stop using Bovine Growth Hormone (rBGH) to artificially increase milk production in cows (it’s outlawed in Canada). There are well documented health concerns for both consumers and cows from its use. Banning the product would cut farmers’ costs, decrease the over production of milk, and help with the bottom line. And the U.S. would join the many other countries who ban this product. I know this won’t happen. When writing a column you do want feedback. The ones below gave me a little more blowback than usual, and from both sides of the issue (a good thing??). So I guess it's important to read both, and love to know what you think. These first appeared in the Island Farmer. It was the retrial of Brookfield Gardens earlier this month on charges related to a fish kill in the North River 4 years ago that got me thinking about how the justice system deals with environmental infractions. Understandably we want those responsible for fish kills or other environmental violations held accountable, but these trials create enormous bitterness and cynicism amongst farmers, the very people we want using good sense and judgement in their day to day use of pesticides. Is there a better way? Investigations of fish kills aren’t easy. Soil samples, and water runoff are collected, dead fish are analysed. Finding a “smoking gun” only happens occasionally. Instead spraying records are collected from all farmers in the watershed. In some cases charges stem from this paperwork investigation that have no actual link to the fish kill. Alex Docherty, a high profile potato grower has never been shy about arguing he’s the victim of a witch hunt related to a fish kill in the Clyde River 2 years ago. There’s been no evidence presented so far that he had anything to do directly with the fish kill, but he was charged with administrative offences under the Pesticide Act related to spraying a neighbour’s field. To Docherty it feels like there was political pressure to lay some charges related to this fish kill, and he was a good catch. Emails Docherty has collected through an access to information request show a variety of government officials including in the premier’s office were informed once the charges were laid. Then when farmers do end up in court smart and very expensive defence lawyers twist and turn words to try to get their clients off: What’s the definition of a waterway? What does cultivate mean? This just feels so unproductive. Let’s think about Brookfield Gardens again. Anybody who knows them recognizes that the owners, the Dykermans, are good people, producing a variety of important vegetable crops, and transitioning over the last decade to an organic operation. They acknowledge that they made a bad mistake in the summer of 2014, producing a conventional carrot crop on sloping land. Some of the charges they faced were because they were trying to add forage to expand the buffer zone to prevent run-off. Chief justice Nancy Orr, who’s shown common sense in cases like this, found Brookfield not guilty in the original trial. However her decision was later overturned because other judges ruled she didn’t have enough evidence to support the verdict. I think she did, because she knew the most important thing: these farmers would never do this again. Had it been handled through restorative justice, the Dykermans could have acknowledged their mistake to the community, the local watershed group, and recommitted to the good farming practices they already use. That’s how you develop accountability. I’ve had a fair bit of reaction to my last column, some positive, much more of it negative. I always appreciate the feedback. I’d argued that a legal concept called restorative justice might be a better way to handle some environmental infractions like fish kills. Anyone found responsible would have to answer to the community of people who were harmed rather than the courts. I’m going to dig the hole I’m in a little deeper. My concern is that too many farmers, most who act very responsibly, feel cynicism and disrespect for environmental regulations and the people who enforce them. If they are charged it’s like the rest of us stopped for speeding, anger at getting caught, rather than any sense of guilt. At the same time many in the public have little confidence in the willingness and the ability of the province to properly manage farmers, especially in the use of pesticides. They feel that the system is too full of carrots and not enough sticks. What makes environmental laws different from other criminal matters is that those charged are guilty until proven innocent (thanks to a course I’ve been taking at Holland College on water management for that). Something has happened, and the person responsible is considered guilty and liable for punishment. The only defense is “due diligence”, did the person take all the reasonable steps expected to prevent the damage from occurring. This can frustrate many because judges will issue “not guilty" verdicts even though the persons charged were clearly responsible. And we have to remember there’s another kind of “due diligence” farmers have to practice. Banks and other lenders, crop insurance agreements, contracted buyers and so on require farmers to manage their crop properly, including using pesticides to control disease and insect damage. Most of the criticism I received (from people I respect) was that restorative justice doesn’t properly punish those who commit serious environmental crimes, that farmers who treat the legal system and the environment with contempt shouldn’t be given another “get out of jail free card”. When I first read about restorative justice a decade ago I had much the same feeling, that the courts, crown attorneys and judges, were the best way to judge crimes, and meet out punishment. I began to think a little differently because of an idea that’s central to restorative justice: normally those charged feel they’re answering to “the state”, with all of the resources and power that entails. They feel every right to fight back, and resent the fact that, in their minds, it’s not a fair fight. With restorative justice they’re answering to the actual people who were harmed, made to understand the damage done. The people who were harmed get to agree on restitution, how to make things right. Restorative justice supporters say when people have a proper understanding of the harm they’ve done, rather than anger and resentment towards the legal system, there’s a much better chance at deterrence. 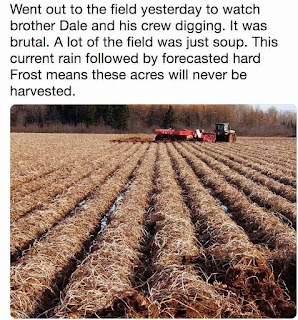 I’m not so dumb that I don’t recognize that there are cases where farmers are not prepared to meet with neighbours or local watershed groups, or even acknowledge they’ve done anything wrong. These cases can continue to go through the normal court system including, where appropriate, use of the much heavier fines under the federal Fisheries Act, for allowing a “deleterious substance” to enter a waterway. Technology is helping too. Newer sprayers can better calibrate application rates and use GPS to prevent spraying in environmentally sensitive areas. The sprayers don’t have surplus mixed pesticide at the end that has to be dumped. These sprayers are not cheap, but will better protect people including the applicator, and the environment. I wrote about this because I’m concerned we’re becoming very tribal when it comes to pesticide use, unwilling to listen to or believe “the other”. With extreme weather becoming the norm, the day to day decisions of farmers are becoming that much more critical. PEI doesn’t have the resources or the political will to monitor every farmer (a drone over every field?) so we have to find other ways to have confidence that farmers are acting responsibly. Using fear of the justice system, layering on the paperwork, is one way to do this. Is there a better way? I've done little planning, but been extraordinarily lucky. New opportunities seem to appear when I got bored, or my boss got tired of me. After teaching at high school and university, and market gardening when I went "back to the land", I spent 30 years working for the CBC, most of it when CBC had the resources to do things that mattered, not the media sweatshop its become now. Again, I was the lucky one.